Isn’t Boston just about the most charming city in our country? Its brownstones, cobblestone, and walkability remind us of places like London and Amsterdam. From biking around the Charles River like you would along the canals to roaming the North End streets as narrow as ones in Paris, this New England city is like a storybook. It’s also home to some of the most beautiful campuses in our nation. And like most European cities, Boston proudly preserves its historic buildings. Also, the culinary scene is as sophisticated and understated as the city itself. Last year, Zagat named Boston the number four hottest food city in the country. We’re calling it: It’s only a matter of time before it gets recognized as number one. If you live in Boston or are visiting this darling destination, keep scrolling. Ahead, we’ve compiled a list of 10 things to do for visitors and locals alike. We’ve included a few of our favorite restaurants in the city, the best places to splurge, and where to chow down on a New England lobster roll. Opened in the summer of 2015, this indoor marketplace features 40 local vendors including farmers, fisherman, and specialty food producers. All of the offerings at Boston Public Market are seasonal and grown, caught, or produced in New England. Find everything from bakeries to cheese shops like Jennifer Lee’s Gourmet Bakery, Union Square Donuts, and Appleton Farms. You can’t visit New England without eating a lobster roll. We suggest making reservations at Island Creek Oyster Bar stat. Zagat agrees it’s one of the best seafood restaurants in Boston. Here, the staff will tell you not only where the seafood came from but also the fisherman who caught them. Must try: Ethel’s lobster roll, oysters, and clam chowder. 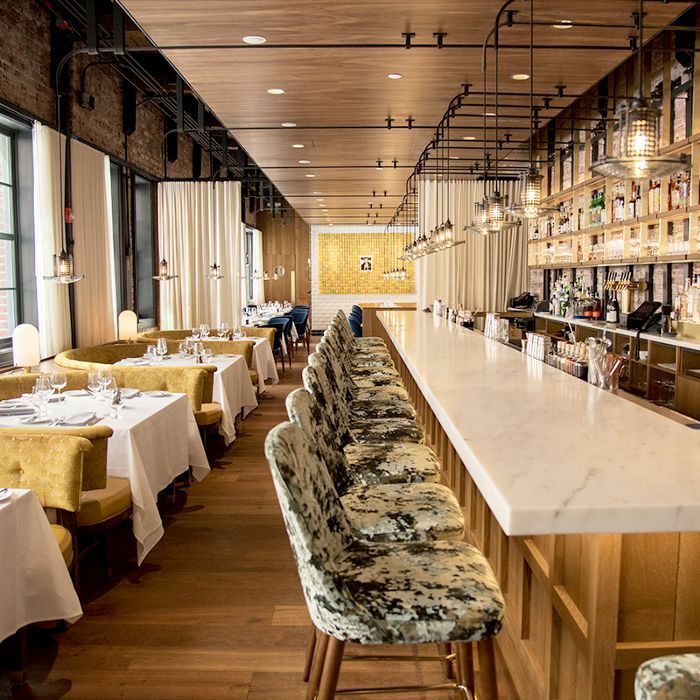 PS: If you’re looking for a restaurant in the Seaport District, visit Row 34, its sister property. We adore the playful wine list at Bar Mezzana, which is broken up by descriptors like Not Quite Merlot, Sorta Like a Pinot Grigio, and (Might Be Close to) Chardonnay. We recommend enjoying a glass of bubbly with the soft scrambled egg, Boursin, and caviar crostini or pairing a wine from In the Key of Sauvignon Blanc section with Bar Mezzana’s daily changing crudo. The 75-store shopping center—including Neiman Marcus, a temporary standalone Cusp (which will soon be inside NM), Barneys New York, and Tiffany & Co.—underwent a major makeover last year, and we’re obsessed. It’s one of the most beautiful malls we’ve ever been (up there with South Coast Plaza). PS: The Instagram account is worth a follow too. Les Sablons, which opened a few months ago, now serves brunch on Sunday from 10:30 a.m. to 2:30 p.m., and we couldn’t be more excited. The two-story restaurant is tucked in Harvard Square’s unassuming Conductor’s Building, where inside, graceful décor offsets exposed brick walls. The brunch menu, which is divided into three sections, includes summer fruit with yogurt and granola; steak frites with wilted spinach, pommés frites, and béarnaise; and a Belgian waffle topped with banana, hazelnut, and chocolate. Hubway Bike is to Boston what Citi Bike is to New York. We recommend getting a 24-hour pass, which is $8, and riding on the Charles River Bike Path or the Emerald Necklace trail. Visit museums like the Institute of Contemporary Art situated on the waterfront, Harvard Art Museums, or Museum of Fine Arts where The Summer of Love: Photography and Graphic Design is currently on exhibit. Share a pitcher of sangria like the lavender rosé made with lavender simple syrup, Grand Marnier, and fresh strawberries at this warehouse turned restaurant in South Boston. The indoor/outdoor space features food trucks and a café. Coppersmith also serves brunch on Saturdays and Sundays from 11 a.m. to 3 p.m.
What’s your favorite thing to do in Boston over the weekend? Share with us in the comments below!